Aurion Anionic Gold Tracers are used to visualize charged moieties in specimens. They bind to polycationic moieties (basic proteins e.g. histones). “Neutral” BSA coated gold tracers are useful for detecting open connections and tissue damage. Under proper conditions and with suitable microscopical techniques the tracers can also be used to follow cellular events in time. The AURION Anionic Gold Tracers are designed to detect multiple positive charge moieties. The AURION Gold Tracers are available in the full range of particle sizes: Ultra Small, 6, 10, 15 and 25 nm. 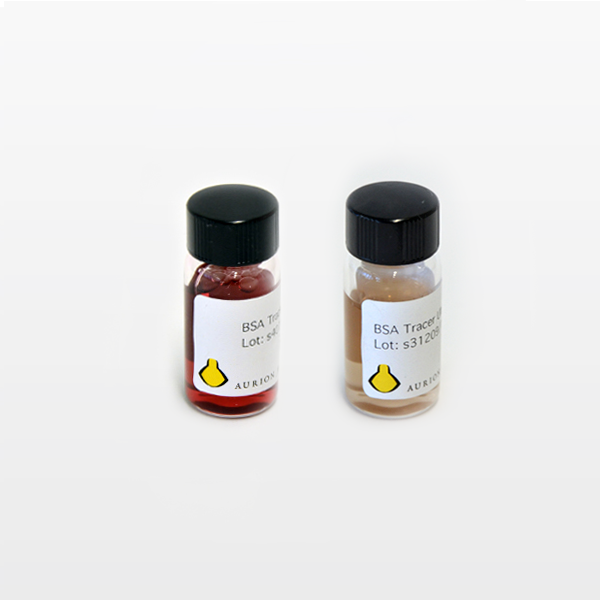 Anionic Gold Tracers are prepared with BSA-c™ as particle conjugated protein. AURION Gold Tracers are available in 5 and 10 ml volume packages and are supplied at an OD520nm of 2.0 for the conventional particle size range and at equivalent OD for the Ultra Small tracers. AURION Gold Tracers are shipped containing NaN3 as preservative. If they are intended for use in living organisms, the preservative has to be removed prior to use. This can be achieved either by dialysis or by buffer exchange using for instance a GE Healthcare Life Sciences PD-10 column. charge interactions are influenced by the presence of ions, di- and trivalent ions being of more influence than univalent ions. The influence is concentration dependent. Binding is stronger in low ionic-strength media. charge interactions are influenced by pH. The charge of components in the specimen is dependent of their isoëlectric point, below the IEP the charge is positive, above the IEP negative. Significant binding of the anionic tracer will only occur at a pH at least one to two pH-units lower than the IEP. BSA tracers are intended for tracking fine capillaries or connecting spaces in intact tissues.